Father Valentinus Saeng C.P. successfully defended his thesis for the Doctorate in Philosophy at the Angelicum (The Pontifical University of Saint Thomas Aquinas) on Tuesday. The title of his thesis was The Ideological Concept of Advertising in the Capitalist Society: A critical study in the light of Herbert Marcuse. I think he deserves a doctorate for thinking up that title! Father Valentinus, from Indonesia, is a very bright young chap and a good linguist too. In addition, I have always found him to be pleasant, cheerful and helpful. (I hear you say that all religious are like that; God bless your innocence.) My sincere congratulations to him on his great achievement. 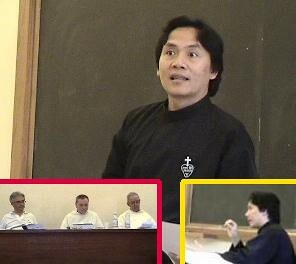 Berenike asked me to mention the Evangelium Conference which is being held in England in August. We have used the Evangelium course here at Saint Mungo’s for the last two years as an introduction to the Catholic Faith for adults. The authors (and others) have now organised a weekend conference on Explaining the Catholic Faith in the Modern World, full details of which can be found at Berenike’s blog. 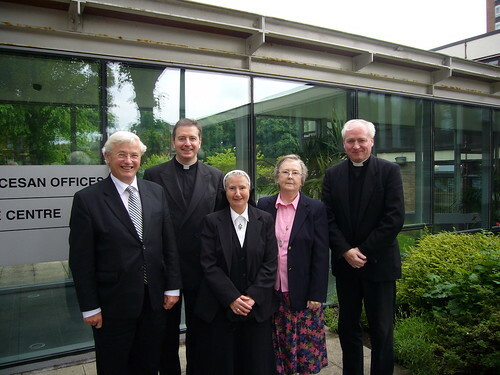 At our recent Provincial Chapter, Father Patrick Duffy was elected Provincial Superior. Father Patrick (-I am one of his classmates!) was born in Ballina, County Mayo but moved to Dublin when he was (I think) about twelve years old. He was educated by the Irish Christian Brothers at Synge Street, Dublin, and visited Saint Paul’s Retreat, Mount Argus as a schoolboy for a retreat given by Father Paul Mary Madden C.P. After working in the City of Dublin Bank, he entered the Passionists at the Graan, Enniskillen, on 2 October 1972. He studied philosophy and theology at the Milltown Institute and was ordained at Mount Argus by Bishop Urban Murphy C.P. on 28 June 1980. After his ordination, he was stationed at Holy Cross Retreat, Ardoyne until he became Vicar of Mount Argus in 1983. He was appointed Rector of Saint Gabriel’s Retreat, The Graan in 1986 and in 1989 he was elected First Provincial Consultor. Since completing his term as Consultor, he has worked in formation as Director of Students and as Novice Master in Ireland, and as Director of Students in South Africa. In recent years, he has been using his skills as a pastoral and clinical psychotherapist at Daneo Human and Spiritual Development Services, Belfast, and living as a member of the Passionist Community at Salisbury Avenue. His Consultors are Fathers Frank Keevins, Brian D’Arcy, Thomas Scanlon and Gary Donegan but, since there are four of them, I’m not going to do biographical sketches – you’ll just have to Google them. tomorrow morning to our Provincial Chapter which is being held at Drumalis, Larne, County Antrim, which is a retreat house of the Sisters of the Cross and Passion. Things should quieten down after this, so I might get a chance to conclude my reflection on Saint Gemma’s vocation. from Liverpool where the Board of Enquiry is concluding the diocesan stage of the enquiry into the life, virtues and reputation for holiness of Elizabeth Prout, better known as Mother Mary Joseph C.P., who founded the Sisters of the Cross and Passion. The enquiry opened on 18 May 1993 and looks set to conclude at the end of July this year. Here’s a photograph I took two weeks ago when the Board was interviewing members of the Historical Commission for the Cause of Elizabeth Prout. Left to right: Professor Bernard Aspinwall (Historical Commission), Father Thomas Wood (Episcopal Delegate), Sister Dominic Savio C.P. (Historical Commission), Sister Martine Neill S.N.D. (Notary) and Father Barry McAllister (Promoter of Justice). Yesterday was the first anniversary of the Canonisation of Saint Charles of Mount Argus – it rained heavily all through the Canonisation Mass. Here’s a reminder for those who were there. Recently, I went with a group of students for a weekend retreat at a monastery. We went there for silence and prayer, but the young people got more silence than they had bargained for, because the first thing they were asked to do on arrival was hand over their MP3 players or iPods, and their mobile phones. Can you imagine the shock and the withdrawal symptoms this caused? –If you can’t, then just picture yourself having to give up your mobile phone or BlackBerry. While many of us say that we would be delighted to be without these things, we might also find it difficult. We complain about the pace of life and the pressures we are forced to live under, but the truth is that some of us actually like it that way. But when the noise and the activity and the rush and the pressure stop, what is left? In the silence, what do I hear? Once a week, this Parliament very wisely sets aside some of its valuable time as “Time for Reflection”. This is both a symbol and a challenge for you. Symbolically, it is your way of saying that you want to be a reflective body, open to the wisdom of the great religious and human traditions of the people you represent. The challenge is to live the rest of your life in the spirit of these few minutes, to make a space in your life every day for silence, listening and reflection….